The Marine HR department has redesigned NORDEN's appraisal system during 2015 and will launch its new system at the beginning of 2016. The system has been developed in close cooperation with a selected team of seafarers that have contributed relevant input and feedback during the development process. The new appraisal system will enable NORDEN to assess the seafarers’ competency level, identify any competency gaps and thereby aid us to provide more targeted training to minimise the gaps. Focus has also been on strengthening internal communication. Every 6 months, a manning session is held where the competencies of NORDEN's senior officers are discussed. This enables NORDEN to better tailor future training efforts. NORDEN conducts 2 annual officer seminars, each seminar comprising of a session in Copenhagen, Manila and Mumbai. The focus of the autumn seminar was on bridging the gap between land and sea. Emphasis was on NORDEN’s values and highlighting that all employees regardless of whether they are land or sea-based belong to the same company and should follow the same set of company values. Therefore, NORDEN’s Golden Rules and values were described and presented at the seminars. The last couple of seminars have provided valuable insight into some of the challenges NORDEN faces. Since many different nationalities are to work together, it is important that NORDEN employees have a strong understanding of cultural differences as well as mutual respect for these differences. Therefore, NORDEN will focus on cultural awareness training in 2016. In addition, NORDEN will focus on leadership training of senior officers as this is a crucial contribution to a good working environment on the vessels. Again in 2015, NORDEN did not have any incidents of discrimination and the retention rate was 94% thus meeting NORDEN's target. NORDEN aims to ensure compliance with regulations and conventions concerning working hours, rest hours, rest facilities and leave to ensure a safe and healthy working environment for employees at sea. In 2015, focus has been on effective planning of working hours and effective performance of work assignments. 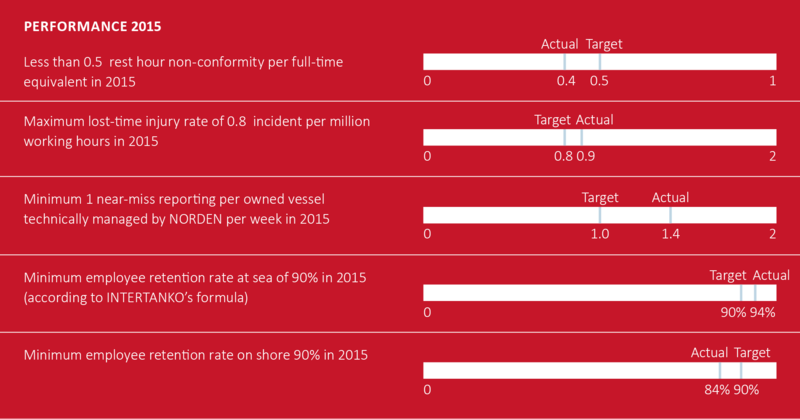 NORDEN's target for 2015 was a maximum of 0.5 rest hour non-conformity per full-time equivalent, meaning 0.5 violations per 1 crew member on board a vessel during 1 month. The target was reached with 0.4 rest hour non-conformity per full-time equivalent. The upgrade of the software for records of rest hours in 2014 has been instrumental in helping us achieve our target. It has enabled NORDEN to monitor each vessel and thereby quickly respond if the rest hour data from a specific vessel deviated from the target. In addition to the online monitoring, NORDEN has continued to conduct safety leadership training in 2015 to promote exchange of information between employees on shore and employees at sea. NORDEN will also continue to maintain a high focus on training and safety campaigns. It is a mindset change, and therefore the importance of rest hour adherence is a key subject on all officers’ seminars. The assessment of the number and types of injuries in the past year helps NORDEN to evaluate whether our incident prevention efforts are successful or should be strengthened. NORDEN has conducted safety awareness campaigns to minimise incidents of LTI, focusing on 5 simple rules about safety, which are described in the box to the right. The LTI frequency rate is measured in work-related incidents per 1 million working hours which cause absence from work for more than 1 working day and calculated as an average over the past 12 months. The target in 2015 was a maximum of 0.8 incidents per 1 million working hours, which was not met with an actual LTI of 0.9 incidents per 1 million working hours. Even though the target for 2015 was not met, the actual number of incidents have been reduced by 1 incident compared with 2014, going from 6 incidents in 2014 to 5 incidents in 2015. In 2015, NORDEN has maintained - and will continue to maintain - a strong focus on safety. There have been no fatalities or other grave incidents in 2015. Safety reporting is key to ensure that NORDEN receives adequate information about health and safety on board vessels. 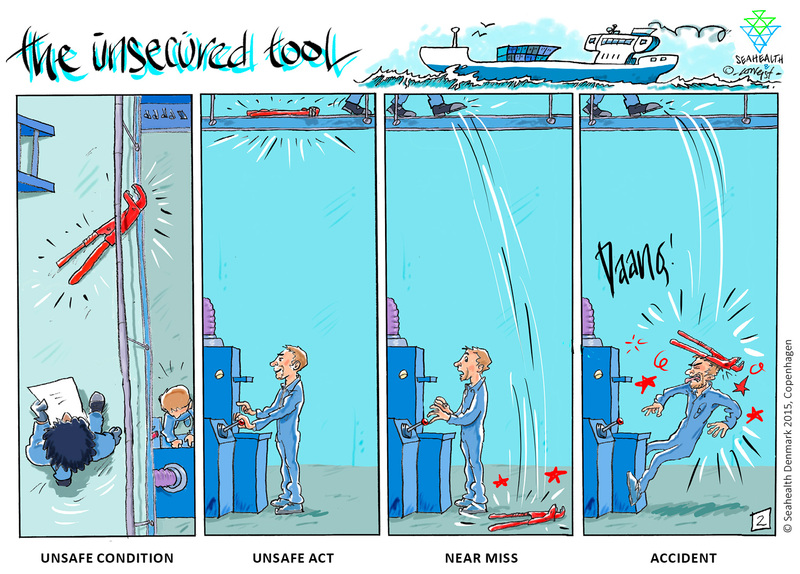 NORDEN has relaunched a near miss reporting scheme, which follows the industry standard dividing incidents into four categories: “Unsafe condition”, “unsafe act”, “near miss” and “accident”, as illustrated below. In addition, NORDEN has shifted focus from quantitative data to qualitative data to better understand the incidents and implemented initiatives to reward good safety behaviour. A monthly safety awareness award is given to a crew member who has actively promoted safety during the course of the month. The award is given by the safety committee on board and consists of a safety awareness diploma, the right to wear the special safety hard hat and a minor monetary reward. NORDEN believes in equal opportunities and fair treatment for everyone and prohibits any form of discrimination and harassment. No discrimination incidents were reported in 2015. NORDEN strives to provide a working environment, which is diverse, inclusive, respectful and tolerant. NORDEN employs 21 different nationalities, and covers a wide range of different age groups ranging from 20 to 68 years. In order to ensure continuity and internal knowledge, NORDEN has a goal of 90% retention rate for employees on shore. However, due to organisational adjustments in 2015, NORDEN only reached a retention rate of 84%, not meeting our goal. NORDEN will increase the focus on this area going forward. NORDEN supports diversity and strives to promote equal opportunities for all employees within the organisation. However, NORDEN recognises that shipping historically is a male profession and that the company faces challenges with regards to gender distribution, in particular in management positions. NORDEN’s Board of Directors has set a target for the share of the underrepresented gender on the Board. NORDEN’s target for the share of shareholderelected women on the Board of Directors is to retain representation of at least 16% (1 out of 6) and aim to increase this share to 33% before 2017. In 2015, the share of female board members increased to 20% due to a decrease in the number of shareholder-elected board members from 6 to 5. When recruiting new board members for election, the Board of Directors consistently consider female candidates. NORDEN has a policy in place focusing on strengthening the gender distribution at other management levels, see Facts, Figures and Assurance for an outline of NORDEN’s gender distribution at management level. In implementing the policy on gender distribution, NORDEN focuses on 3 interconnected areas. Firstly, NORDEN works to identify and address the root causes to the uneven gender balance. Identifying and addressing root causes helps to ensure that NORDEN does not loose female talents due to unnecessary perceived or actual structural impediments. NORDEN does this for example by analysing feedback from exit and appraisal interviews. An interconnected focus area is to strengthen the retention rate of existing female employees within the organisation, in order to build an internal pipeline of female talents. NORDEN does this by offering flexible working hours, management training and by focusing on employee worklife- balance. The third focus area is to work to attract female candidates to the specific positions from which future managers are typically promoted. In 2015, NORDEN hired 4 female shipping trainees, which gives 18 trainees in total with a gender distribution of 45% female and 55% male trainees. NORDEN recognises that achieving a diverse and balanced gender composition at management levels is not something that is achieved overnight – it requires a long-term focus and commitment. Therefore, diversity also be in focus for 2016. During the course of 2015, NORDEN developed the company's human rights due diligence process based on the UN Guiding Principles on Business and Human Rights (UNGPs). NORDEN conducted 2 human rights impact assessments — 1 for onshore employees in NORDEN’s headquarters in Hellerup and overseas offices, and 1 for seafarers on vessels owned by NORDEN. Focus of the impact assessments was the 48 human rights listed in the International Bill of Human Rights and the re­quirement of the UNGPs that all companies should identify their adverse impacts on these rights. For each human right, NORDEN has evaluates whether or not NORDEN is at risk of adversely impacting the right given the industry, the locality and the nature of NORDEN’s business. For the rights at risk, NORDEN assessed whether there is an actual or potential adverse impact on these rights and if any of the identified impacts could be determined as salient human rights impacts. The UNGPs define salient human rights as those rights that are in particular high risk of being severely impacted by a company’s activities or business relationship. Next step was to conduct an analysis of all relevant policies and procedures in relation to the 48 human rights, to identify gaps. For all rights, where NORDEN had an actual or poten­tial adverse impact, NORDEN identified the affected stakeholders, how to track the effectiveness of the response and what type of re­mediation activities was offered to the impacted stakeholders. The assessments were conducted in collaboration with the HR department for employees on shore and with Marine HR depart­ment for employees at sea. If adverse human rights impacts are identified, NORDEN prioritises these and takes actions to prevent or mitigate accordingly. NORDEN tracks effectiveness of the actions taken to continue improvement. For the prioritised impacts, NORDEN is also committed to provide or collaborate around their remediation. To reflect the process NORDEN has gone through in 2015, an updated Human Rights Policy will be implemented in 2016. In 2015, 2 salient human rights issues were identified at sea. Based on the human rights impact assessment, NORDEN has identified an actual adverse impact on the right to rest, lei­sure and paid holidays as 0.4 rest hour non-conformity per full-time equivalent was registered in 2015, as described under the section Em­ployee Conditions. To prevent and mitigate this impact, NORDEN focuses on training and safety campaigns, and to remediate this impact, NORDEN offers various types of compensation to employees. The other salient human rights issue identified con­cerned the right to life. NORDEN has, like the rest of the shipping industry, a potential adverse impact on the right to life, as vessels are a high-risk workplace. NORDEN can both cause and contribute to this potential adverse impact – cause by not ensuring that our vessels are maintained and the crew is properly trained, and contribute if the security guards, NORDEN hires on our vessels when sailing in high-risk piracy areas, cause fatalities. To prevent and mitigate this impact, NORDEN ensures that vessels and safety equipment is properly maintained, NORDEN continuously organise security campaigns and training sessions, and NORDEN conducts due diligence on the security guards hired. In case of an unlikely ac­tual impact, NORDEN will remediate this in close cooperation with NORDEN's insurance company who is responsible for handling these issues. In parallel with the human rights impact assess­ments, since September NORDEN has actively participated in the UNGPs Professionals Network hosted and facilitated by Global CSR, a leading consultancy in the area of business and human rights. The network has participants from various industries. The purpose of the UNGPs Professionals Network is to create a cross-sectorial business-driven forum where professionals, tasked with the implementation of the UNGPs in their company, can share views, knowledge, solutions and receive expert input to challenges in implementing the UNGPs. The network also enables participants to stay updated on the international developments and best practices concerning implementation of the UNGPs. In 2016, NORDEN will focus on communicating the results throughout the organisation, arrange human rights awareness training and develop and implement the procedures de­scribed in the human rights action plans. In 2015, following NORDEN’s recommendations, D/S Orients Fond supported a variety of different projects such as Mission to Seafarers, which provides worldwide help and support to 1.5 million men and women seafarers. Sailors Society received funds for a minibus for their new port chaplain in Salvador, Brazil as well as the running costs of the bus for 5 years. Support was also given to the Port Integrity and Efficiency Project piloted by the Maritime Anti-Corruption Network (MACN). The project aims to bridge the gaps identified in the Nigeria Risk Assessment Project conducted by MACN and UNDP in 2012-2013, which analysed the specific corruption risks in six Nigerian ports. Lastly, funding was provided for a 2-year scholarship for students for the Singapore Management University. Through D/S Orients Fond, NORDEN has supported Save the Children Denmark’s project in Somalia since 2009. We have supported a specific project from 2013 to 2015, which aims to contribute to the creation of a sustainable and coherent education system by providing education adapted to the different age groups in Somaliland and Puntland. To learn about the results of the project, read the following status report provided by Save the Children.